Stained Light (2018. 440 pages) is the last book in The Gaia Chronicles tetralogy, written by Naomi Foyle. The book proudly proclaims that it is ‘For Hunger Games fans of all ages’ but I am not sure that this isn’t a case of false advertising. The books are very different. While Hunger Games was decidedly a young adult novel, which could be enjoyed by adults, the portrayal of violent sexual acts, the language and general tone may not make this book suitable for a young audience. 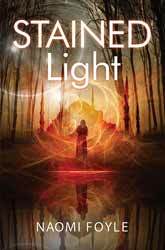 Following her travails, chronicled in the first three books, Astra Ordott finds herself banged up in an Is-Land prison, branded a traitor. Outside the walls of the prison rivalries and tension threaten to destabilise the land, while at the same time Astra is informed by the world gods that mankind has a year to turn its back on metal, or the gods will destroy them. Although the novel is set in the future, many of its themes explore the nature of sexual identity and family structure. There is also a strong ecological theme looking at man’s use of the world’s natural resource. But the greatest theme is that of personal and political inequalities. There is little in my mind to doubt that Foyle has meant the reader to spot the analogist connection in what is happening between Is-Land and Non-Land and the conflict between the Israelis and Palestinians. Whatever her personal thoughts on the matter, she is fairly even handed when looking at the characters motivations and she has written in a level of nuance, which precludes the simple idea that things are either right or wrong, or that people can be separated into the good and the bad. While the series has its merits, this novel is told from multiple points of view with a writing style which is quite heavy. Therefore this book does not succeed as a stand-alone novel. There is too much information presumed for you to easily follow what is happening. There are a couple of maps and a Dramatis Peronae, which runs for six pages, which gives you some indication how complex the narrative is. If you’re interested in political allegory placed in a science fiction setting, then I would start with the first book in the series, Astra.